Haikonen envisions autonomous robots that perceive and understand the world directly, acting in it in a natural human-like way without the need of programs and numerical representation of information. By developing higher-level cognitive functions through the power of artificial associative neuron architectures, the author approaches the issues of machine consciousness. Robot Brains expertly outlines a complete system approach to cognitive machines, offering practical design guidelines for the creation of non-numeric autonomous creative machines. It details topics such as component parts and realization principles, so that different pieces may be implemented in hardware or software. Real-world examples for designers and researchers are provided, including circuit and systems examples that few books on this topic give. an approach towards the use and understanding of natural language in robots. 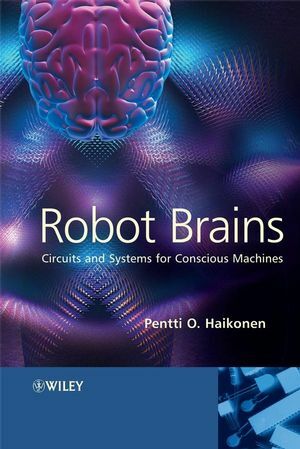 Dr Pentti Haikonen is an experienced contributor to the field of machine consciousness, conducting research on the topic for over 10 years. He is currently a Principal Scientist in cognitive technology at the Nokia Research Center, Helsinki, and has written the book The Cognitive Approach to Conscious Machines (Imprint Academic, 2003) and the book chapter "Artificial Minds and Conscious Machines" in Visions of Mind: Architectures for Cognition and Affect (Idea Group Inc., 2005). Haikonen is known for putting forward the theory that "the brain is definitely not a computer. Thinking is not an execution of programmed strings of commands. The brain is not a numerical calculator either. We do not think by numbers." Rather than trying to achieve mind and consciousness by identifying and implementing their underlying computational rules, Haikonen proposes "a special cognitive architecture to reproduce the processes of perception, inner imagery, inner speech, pain, pleasure, emotions, and the cognitive functions behind these." He has given lectures on machine cognition at the Helsinki University of Technology and has several patents and patent applications on cognitive and neural systems.